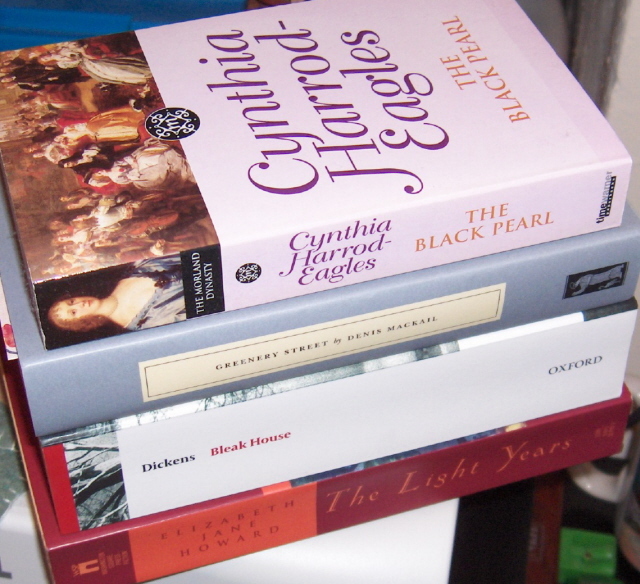 The Black Pearl by Cynthia Harrod-Eagles - Over thirty books have now been written following the Morland family from the 15th century through the present day. I think the author is up to WWI. The Black Pearl is book #5. I have quite a ways to go. The books I have read I have enjoyed, and I own all of the books that are available in paperback, so there is no reason not to read them. I meant to pick up a few of these this year, but I don't think I've read a single one, and I am very much in the mood for more of the Morland adventures at the moment. This particular book is set in 1659 at the beginning of the Restoration. Greenery Street by Denis Mackail - I did mention that I wasn't quite sure which Persephone I wanted to read next. After a quick perusal of the books I have on hand that I've not yet read, I decided Greenery Street sounded like the perfect choice. It's another book where not much happens but the day to day business of living. This time around it is a pair of happily married newlyweds that take center stage. Bleak House by Charles Dickens - This is the one book I am assured of starting this week. There is no rush to get through it, I just want to take it at a nice leisurely pace. In looking at the notes on the text, Bleak House was originally published in serial form beginning in March 1852 through September 1853. How's that for leaving readers hanging? I am hoping, however, it won't take me a year and a half to read! I'm giving myself the winter season and will see what happens. The Light Years by Elizabeth Jane Howard - This is the first book of the Cazalet Chronicles. There are four books in total and ages ago I read the first three. I'm not quite sure what happened to the fourth, but I don't recall ever reading it. It seems silly to read the last one now on its own, so I thought it would be good to start at the beginning. I have a feeling it is going to be like reading this for the first time, as my memory can be atrocious after a while. I'm looking forward to watching the BBC adaptation when I finish. Only one full week of work and then I have a short week and a few vacation days to look forward to. Bring on those vacation days!